I think your mutation rate looks too high, usually it’s in the order of 1%. Did you tried with lower values? Parametrizing only weights is very rigid. The whole algorithm is too simple, and thus optimum weights give weird looking strategy. Ideally, one could evolve whole behavior, by evolving structure and weights in neural network or some “algorithm describing chain of operations”. How would you evolve also structure, can you please clarify? You need a way higher population size. Check out Genetic Programming by John Koza. How the F* are you only 16? Yeah, height penalty only after 4 would match how I play. Would be fun to tune an algo specifically for tetri, give a huge bonus for four. Actually you are basically using genetic algorithms to evolve your fuzzy AI system. Neat, nevertheless. It’s a pity that the story ends so quickly. It was really written in a way to learn a lot about it. Maybe the problem was too simple. Maybe the goal should be different that you can actually start the learning, meaning that you learn how to better choose your fitness and selection functions and how to find the problem in a model you set up yourself. Not sure how this came up, but the AI does rotate the blocks. It would be silly not to. It’d be nice to be able to run the genetic algorithm for hundreds of generations, but simulating an entire tetris game is pretty intensive, and takes about 5 or 10 minutes per generation when I put the speed at max. My program doesn’t seem to be stable enough to run for days at a time (all kinds of weird race conditions going on). Run the AI against a half height, 10×10 grid. Using 10 columns is *very* important, as survival strategies change with less or more columns. The 8 column simulation is giving you bunk data for an actual game But since you seem to be trying to tune the AI for survival, 10 rows instead of 20 involves uses the same strategies, but just ends orders of magnitude faster. As to your tournament function, are you running each candidate several times and testing the -averages- against each other? If not a bad mino run, early or late, would make a perfectly strong candidate appear weak, again making your runs meaningless. When writing a Tetris AI myself I found I needed about 60 runs of each candidate before the average lines cleared became somewhat stable. You should strongly consider changing the selection. Keep the best candidate to prevent losing any effective values. Consider moving away from tournament selection and just do the random crossover you have already. If you are converging at a local minimum, then not enough variation is being created. Your tournament is a major contributor to that. Also, implement a mutation to zero out parameters, as their actual presence may inhibit the most effective strategy. Rethink the fitness function. If bad runs will result, then either use a static seed or use a probabilistic score, like average score or macimum score over 10 runs. Finally, try more than just 10 generations. I have optimized simple functions that took 100,000 generations to reach a high level of fitness. Good luck. Machine learning is very exciting. Hey, great work! I’ve been programming GAs and their variants for a number of years, off and on; only used them professionally back in ’89, but research such as you’re doing is all kinds of fun. The best part of this is that you’ve *thought about what happened* and learned from what you did. This is one of the more amazing things about AI in general. So, some opinions: First of all, the recommendation for Koza’s “Genetic Programming” book isn’t wonderful. If you can find a really cheap copy of his book, it’s great for stealing ideas from 🙂 but the GP idea is an evolutionary dead end (har!) and is vastly surpassed by GEP. Check out Gene Expression Programming http://www.gene-expression-programming.com/ which has an excellent discussion under the “Tutorials” link. GEP in effect writes a program for you… but it’s not a magic bullet. Ordinary GAs (such as what you implemented) which tune numbers used by the fitness function are incredibly useful when appropriate. Also (and some of the comments above bear this idea out) watch out for the advice you’ll get from people who’ve never worked with GAs. Something that comes up *constantly* is that people will say, “Gee, nice idea, but that crossover thing doesn’t seem to make any sense, I can’t see how it’s useful, just get rid of it and only use mutation!” But that’s just hill-climbing, and (you’ll find) much less successful than full operation GAs. Yeah, every algorithm (except on trivial problems, in which case, why invoke AI at all?) can only find a local maximum. But GAs are better than most at finding a *good* solution. And yeah, eventually your population will converge. The GENESIS package (an early “C” implementation of GAs) had some great statistics. First of all, it really implemented the numbers as bit-strings. The downside was a loss of speed, the upside was that it kept a count of “converged” and “lost” bits. A bit was considered “converged” if more than (IIRC) 70% of the population had the same value for that bit. “Lost” meant that 100% of the population had the same value for a bit. So when your population converges, you can either turn the mutation way up (so that it diverges again) or just start a new population. Another thing that’s useful to help stave off convergence is to not do “pan-mictic” (love them crazy biology terms 🙂 breeding. What that means is that instead of choosing parents from the entire population, they are chosen to be fairly close to each other (at some metric). This sometimes has the effect of having multiple solutions found in the population at the same time, but the boundaries between them are pretty bad. This is really neat. I’d definitely suggest trying to make a more stable program and letting it run for a few days. You might be interested to know that the FCEUX NES emulator has Lua scripting support, which is sometimes used for bots. So you could potentially do this with the real NES Tetris! Ever think about posting the AI source along with your java client? The whole thing is open source; the link is in the first sentence. Glad you found my article useful. Great work on the tetris algo! The last output of your program is easilly explained. you see it will give penalties for clears and it rewards holes. So, it is trying to make tetrisses, like the well experienced human will do. Awesome post. As someone who made compute to play Tetris I can totally correlate to what you are talking about here. That too I wrote my game in Java too. I even made it as an applet and put it up on the web a few years back. You can go to the website and in the menu choose “Options -> Computer Plays” and then from “Game -> New” and see the game being played by the computer. I never thought along the lines of using GA to solve this problem. I did like what you had, some heuristics. I have in my to-do list to integrate my applet with a scripting engine so that people interested in focusing on writing a clever algorithm can submit their code and test it and I can keep track of the best algorithm. I haven’t done it as I didn’t find a good way to compare two separate runs of the game (as the blocks are random). But I recently got some ideas on how to work around it. If I manage to execute my grand plan, I will let you know. Neat program. It looks like you did a good job with it. I once managed to produce a GA that made worse results every generation, and it had elitism. I don’t think you incorporated enough weights to make the AI sufficiently complex. Ideally, the GA could represent ANY algorithm you could imagine if it was “perfect.” 7 weights doesn’t come very close to it. Also, I have a suggestion for the “height” addition. You should calculate the increase it adds. Basically, find the maximum value of newheight – oldheight, in every column. That might make it more realistic. Also, I had an explanation for the penalty for single-row clears. It could be like you said that it’s overwhelmed by the height decrease. It could also be that it’s used to encourage double-row clears, which is 3 times as many points. Also, rewarding blockades could be a strategy to quickly forget about holes. Basically, it could choose to make another hole or another blockade. It makes sense to reward blockades so you don’t have a structure that looks like Swiss cheese. Quickly covering holes in each column would penalize every mistake (producing a hole) after your first one in each column A LOT. Still, I thought your analysis of what it was doing was pretty good. I would be interested in seeing how well a GA could perform if it had many more weights to look at. Excellent, However i have to disagree with you “AI doesn’t put them were a human would” as it plays very similar to me. Hi, nice work! You’ve done a great job explaining the pieces of GA.
I’m also doing a tutorial on this, using Java. An ideia is to assume that a feature is either positive or negative, so you can take a random between 0 and 1, narrowing the search space. Another ideia is to fix a sequence of n random games, and let each agent play the whole sequence, taking the average of cleared rows as fitness! Check out my blog if you can (it’s in Portuguese, but the translation is trivial). Right now I am working on a RTS game build order script, inspired by – http://lbrandy.com/blog/2010/11/using-genetic-algorithms-to-find-starcraft-2-build-orders/ .. however I tried editing his scripts and they were quite a hassle, so I’m working on my own. This discussion has helped me focus on what functions are a priority, so even though this isn’t a ‘tutorial’ it’s very useful to have around. I look forwards to seeing what you script in the future. You thought about open sourcing this code? This program taught me how we can use two dimensional array to draw a board with boolean indicating something is there . Never knew, can use array like that. Pingback: How you can Make an Evolutionary Tetris AI — HowTo: Do it yourself! I’m having a hard time wrapping my head around the fact that the scoring method is the chromosome of the genetic algorithm. According to the way I understand it, a genetic algorithm should have a constant scoring formula and some behavior that changes in order to score better. In a situation like this, doesn’t the question become, “How do you score the scoring formula?”? 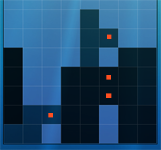 So instead of learning to score well in Tetris, it seems like this algorithm is doing something more like learning a scoring formula with which it is easier to get high scores in Tetris. The chromosome determines the score of potential future board states, which affects which position it thinks is the best. So it is learning how to play Tetris better. Okay I get it now! So there are really two scoring formulas. One is the regular in game score, 40 points for a single line, etc. I missed that part. This score determines how good is the other scoring formula which was used to determine the moves. I had a Eureka moment.